Edmond Roudnitska, born in Nice in 1905, is widely considered one of the greatest perfumers of all time. He began studying perfumery in Grasse in 1926, at the age of 21. In 1927 he moved to Paris, where he worked until 1949, for Fabriques de Laire among others. During this time he composed both bases and finished perfumes. Roudnitska established his own independent company, Art et Parfum, in 1946. In 1949 Art et Parfum moved to Cabris, a town in the foothills near Grasse. Roudnitska lived there until his death in 1996. Art et Parfum is currently run by Roudnitska's son, perfumer Michel Roudnitska. Roudnitska was a prolific author on technical as well as philosophical matters relating to perfumery. His books include Le Parfum and Une Vie au Service du Parfum. I do not think it is the creative capacity that is lacking, or the capacity for understanding on the part of the public (which remains what it has always been). What is in process of petering out is the capacity for starting something. It is really responsible people who are lacking, and it seems that to-day there is no man capable of launching a Chanel No. 5. — From Where Are We Going?, an English translation of a talk given in November 1967. To judge a perfume is, above all else, a matter of taste. Taste evolves under the influence of the environment, but this fact must not prohibit judging the environment. Taste evolves chiefly with the acquisition of learning, with the knowledge of facts and of aesthetic accomplishments, which makes it possible to analyze them and to provoke instructive comparisons. It is thus that each of us can progress along the road of beauty and of art. To deny the usefulness of this training would be like refusing to admit that a symphony is better appreciated after one has studied music. — from Concerning the Circumstances Favorable to the Creation of an Original Perfume, an article which originally appeared in the April/May 1984 issue of Perfumer & Flavorist. See all articles on Now Smell This tagged Edmond Roudnitska. Read about Edmond Roudnitska's garden at Cabris (and Serge Lutens' garden in Marrakech) in Grow Your Own Perfume at the Telegraph. 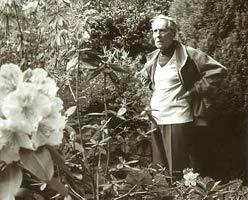 You can find reprints of selected articles written by Edmond Roudnitska at Anya's Garden. You can find lots of good information about Edmond Roudnitska on the Art et Parfum site, including a piece written by Jean Claude Ellena (in French) and a 1995 article from National Geographic.